A few months ago, Blogger and Facebook stopped talking to each other. It used to be that you could set up a link from your blog posts to your﻿ page, in the form of a note. Not the best way of communicating, but at least cross-posting was somewhat available. I had a little following there on the Facebook, and kept up with it as long as my posts were being fed to the fb page. But I never saw THIS! 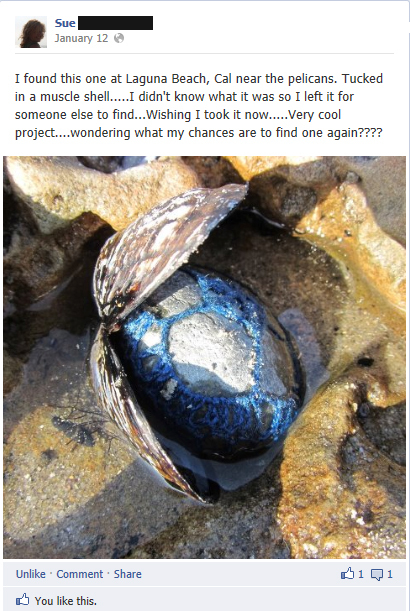 In fact, I found this just a moment ago - a post written after my Laguna Beach pebbling in January. I feel so badly that I didn't get back with the poster in a timely manner - my apologies, Sue! It REALLY makes me wonder about all the things that happen to these pebbles after I leave the beach!